Get the money market account that can help you save toward important financial and life goals, while providing many other perks along the way. Monthly transaction limits apply. End the rate shopping chore with our Yield Pledge® accounts, all of which deliver a yield in the top 5% of Competitive Accounts. Yes, fees can happen from time to time, but we make it our business to never nickel and dime you with a monthly account fee or ATM fees. Keep a minimum of $5,000 in your account, and we’ll even reimburse you monthly for all ATM fees charged by other banks. For balances under $5,000, get reimbursed for up to $15 in ATM fees monthly. 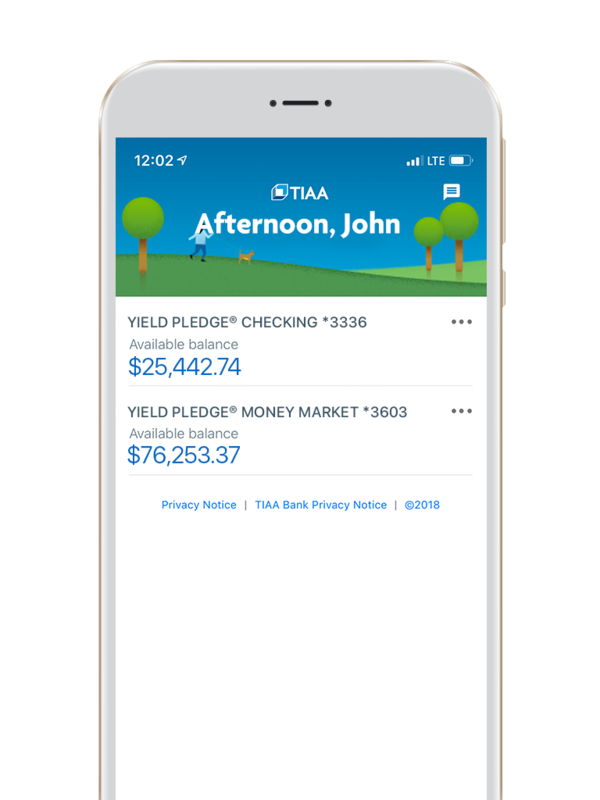 Use the TIAA mobile app to bank smartly, on your time and from nearly anywhere on the globe. Got five minutes? That’s about all the time you’ll need to run through our quick and seamless online account application. Open your new account online and with ease. Send an opening deposit by mail, mobile deposit or online transfer. Set up online banking and watch your money grow.